It needs no describing that this is pretty much an Indian flavored pizza. Nothing new or original. 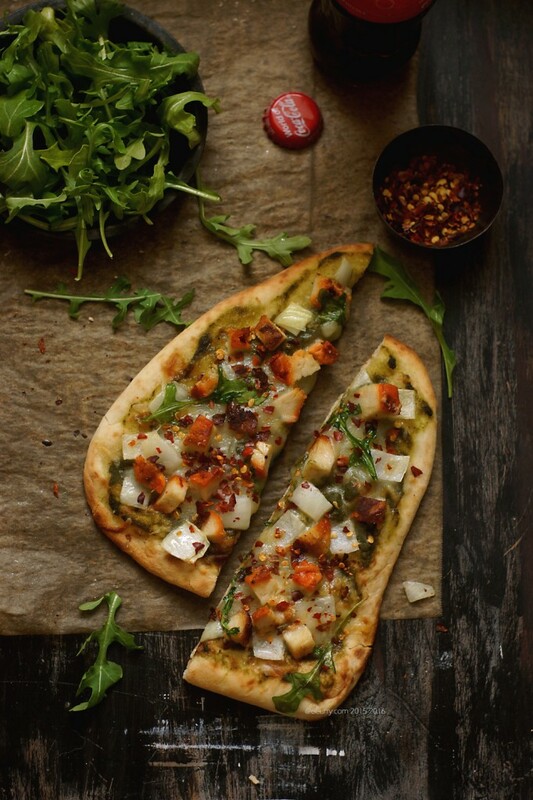 Naan pizzas are everywhere. Or are they called “Naanizza”? I came across that recently! They have been creating sensations for a while and it does not seem that they will fall out of trend soon. 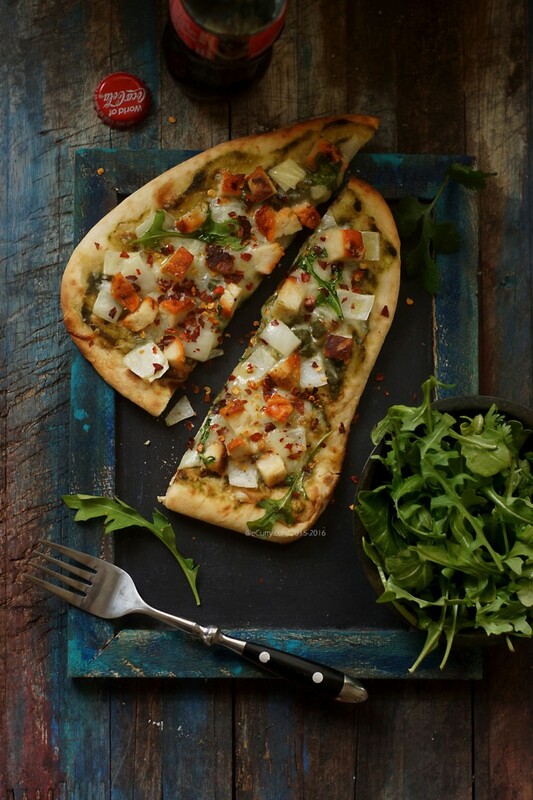 However how often do you make a pizza with the bold Indian “green chutney” ? Mint and Coriander chutney, or what I call an Indian Pesto, makes the zesty sauce here. That makes all the difference. 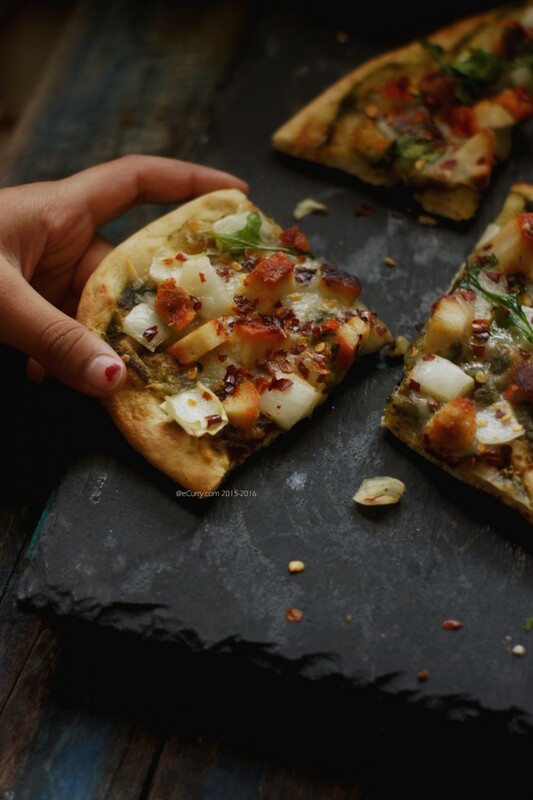 Whatever flavors the Naan Pizzas come in, whether it be a snack or a meal, little hands or big hands grabbing a slice, they usually disappear pretty quickly. You cannot beat the convenience. Naan makes way better crust than the limp, stale pre-made pizza bases found on the store shelves. 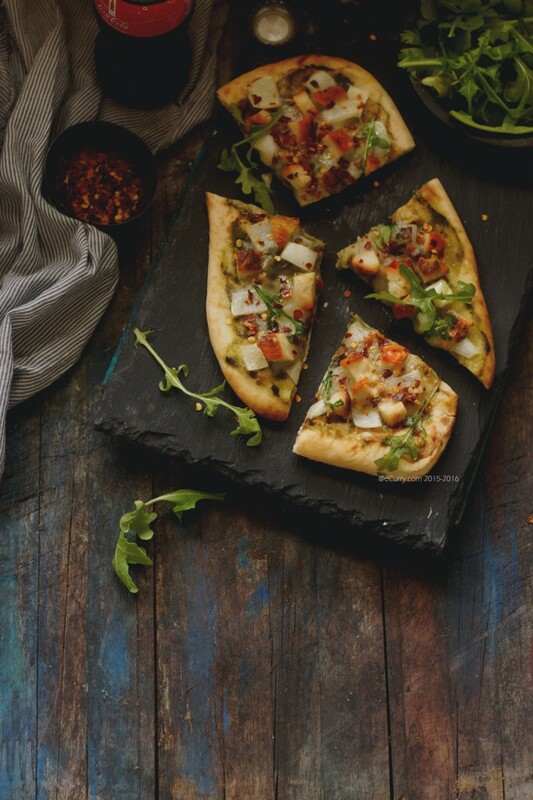 It has the right rise, and texture and even if you are going to use store bought Naan which have been frozen, you still end up having a perfect pizza. 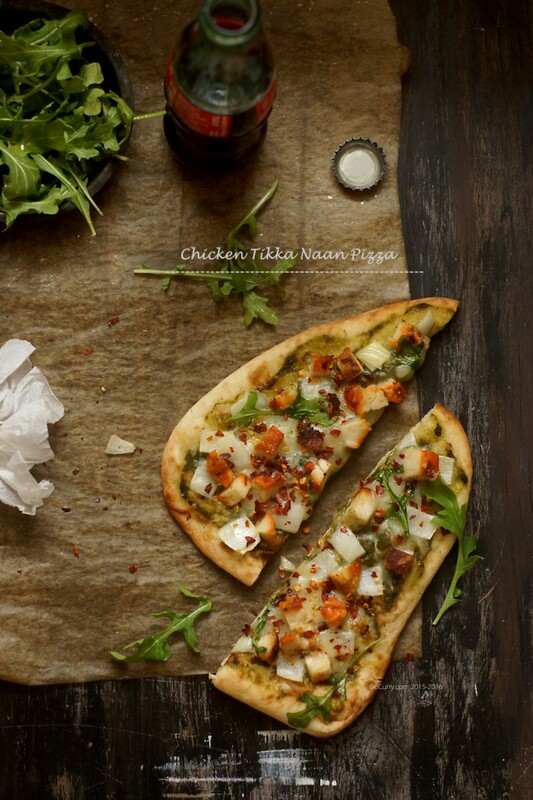 The fact is that Naan is made in the Tandoor, and that is what makes it closest to the fresh brick oven pizzas. 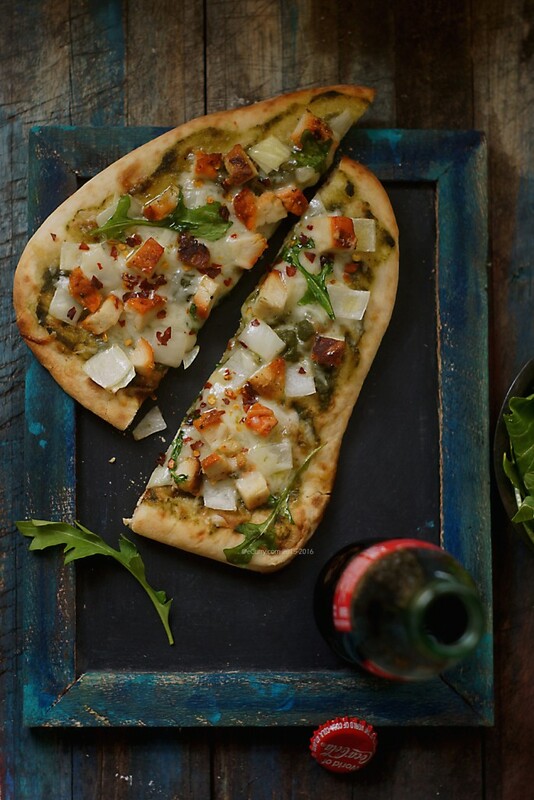 If you happen to have leftover homemade Naan, you can make this a totally homemade affair. Our favorite is Deep’s Tandoori Naan. Deep has five tandoori cooked Naans in a bag for less than $5 and they freeze really well. I like these better than the ones which are found on the shelves. Most Indian grocery stores sell the Deep Tandoori Naan in the frozen cabinets. 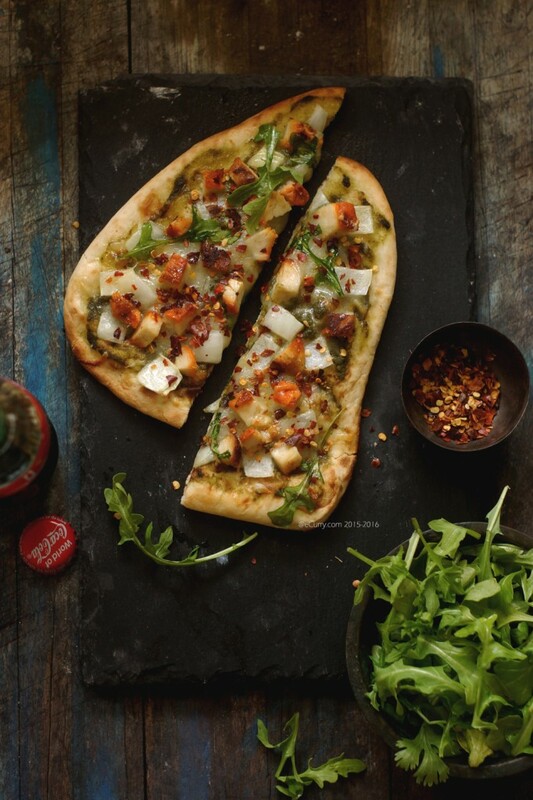 One Naan base makes a single serving and it allows the option of customized pizzas for everyone. We have to do this in our family as each one of us favors different toppings and flavors. Always. You would understand that one really does not need a recipe for this sort of dishes. If you know how to top a pizza you would be able to make this quite easily. Just a small example of how the world is getting closer and concepts and flavors fuse. I have used coriander and mint chutney, aka green chutney today instead of the Italian tomato sauce, some cheese of course (though it can be done totally without! ), topped it with onions and the very Indian Chicken Tikka. No, not the “tikka masala” kind of chicken but the spiced and grilled bites or tikka, that I already had made the night before. Garnished with fresh baby spinach and arugula and crushed red pepper of course, it was the most delightful lunch and the kids indulged on their after school snack. Time to create you own. Enjoy! 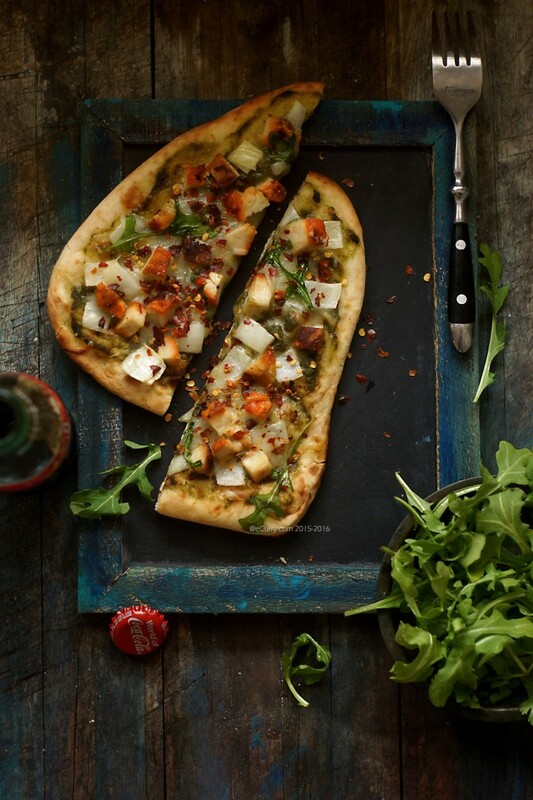 Note: there are unlimited ways to make this pizza the way you like. I have only mentioned what I have used. Use your own topping and your favorite herbs, and cheese. The proportions are approximate and may be adjusted to personal taste. If you are using frozen Naan, defrost them for a while if possible. It just makes the baking quicker with a better crust. 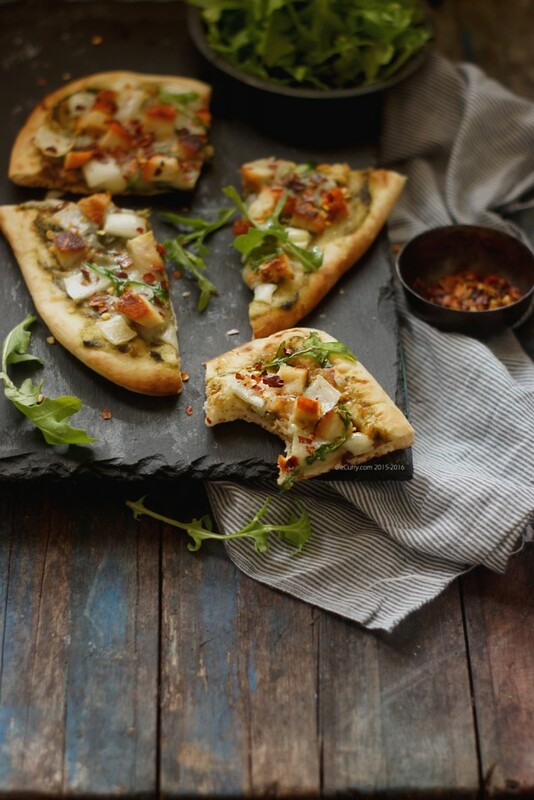 Spread the coriander & mint/green chutney evenly over the bubbly side of the Naan. Top it off with part of the cheese on the Naan. Top with diced Chicken Tikka, onion, bell peppers if you are using and fresh greens. Add the rest of the cheese over the topping. Drizzle some olive oil over the cheese and topping. Place prepared Naan in the preheated 375 F oven and bake for 10 to 12 minutes, or until cheese melts and crust is golden brown. Top with crushed red pepper if you want. 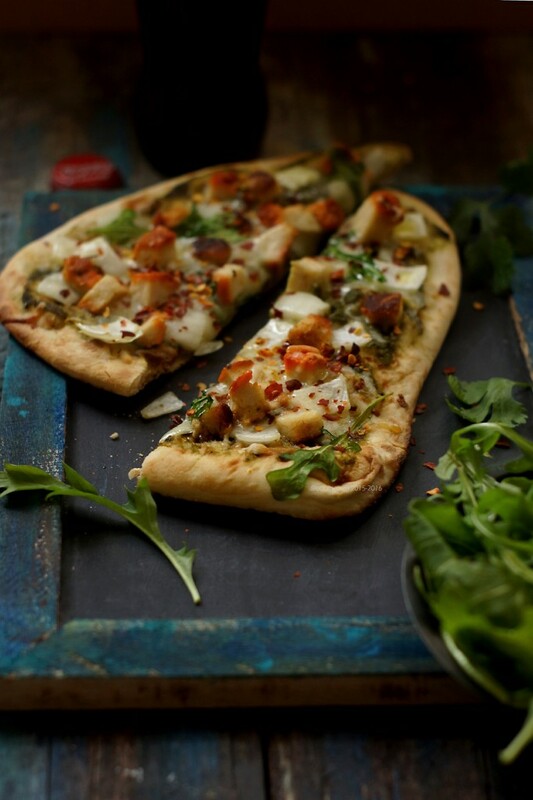 What a delicious idea to make a tikka naan pizza! This is definitely a perfect recipe for me.. thanks for sharing it. Can I have one slice of this pizza? Really yummy!